Clyde Stubblefield, James Brown's Funky Drummer, Dies At 73 : The Two-Way The revered drummer, who suffered from bladder cancer in the past, popularized the breakbeat and became one of the most sampled musicians ever. 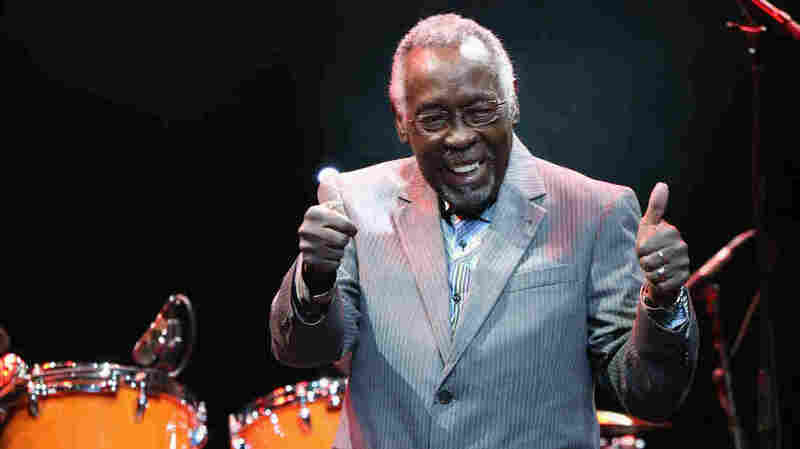 Clyde Stubblefield, seen here January 14 onstage at The Novo in Los Angeles, has died at the age of 73. Clyde Stubblefield, the funk drummer whose work with James Brown made him one of the most sampled musicians in history, died Saturday morning in Madison, Wis., his publicist confirmed. Stubblefield was 73; his publicist did not provide a cause of death. For most of his career, Stubblefield was better known in sound than in name. He joined James Brown's backing band in 1965, one of countless musicians on an ever-rotating roster. As he told NPR in 2015, the ensemble seemed to have more than enough drummers already when he showed up to audition. "I went on stage and there was five drum sets up there," he explained. "And I'm going, 'Wow, what do you need me for?'" Still, his recordings with Brown managed to rise above the competition: Songs like "Cold Sweat," "Say It Loud — I'm Black And I'm Proud" and "Mother Popcorn" are now revered as a gold standard for funk drumming. A generation later, he would have an even bigger impact on hip-hop, as the pattern he'd played on 1970's "Funky Drummer" proved irresistible to producers. The track's distinctive break, a sixteenth beat punctuated by deft, delicate snare hits, has been sampled on hundreds of songs. Perhaps most notably, Public Enemy's production crew The Bomb Squad made "Funky Drummer" the backbone of 1989's "Fight the Power." That song in turn became the unofficial theme music of Spike Lee's Do the Right Thing, echoing through the streets of Bedford-Stuyvesant and foreshadowing the fiery confrontation in the film's climax. Sampling was still a legal gray area in the late '80s, and Stubblefield's contributions to hip-hop's evolving sound went largely unrecognized — and uncompensated — for decades. In 2009, a PBS documentary called Copyright Criminals aimed to bring the legacy of Stubblefield and other sampled musicians to light. Two years later, the drummer joined Public Enemy's Chuck D and The Roots on the stage of Late Night with Jimmy Fallon — where, at long last, he performed his part of "Fight the Power" in the flesh. Stubblefield made news last year when he revealed that Prince donated $90,000 to help him pay his hospital bills, after the drummer developed bladder cancer in the early 2000s.